Good morning quiz: how to cope with high fuel prices in aviation? Just flying slower to save fuel! …not quite: as other costs directly related to (and increasing with) #flighttime, can even exceed the gain from fuel savings. “Cost Index” (CI) is a very helpful approach to balance these factors, and the functionality is incorporated in modern #planes’ FMS. Some basic math as an appetizer: CI = (time-related operating cost) / (fuel cost); unit: kg/min. Not into formulas? Here’s to you: “CI” is a ratio comparing flighttime costs vs fuel costs, helping to find the ideal speed for a particular flight. It effectively tells you which amount of fuel generates costs equal to 1 min of flighttime. For a specific aircraft, a given CI corresponds to a certain TAS (true air speed) in still air / standard conditions. CI 0 equals max range cruise (minimum fuel), maximum CI = max operating speed (minimum flighttime)- the optimum is hidden somewhere in between. 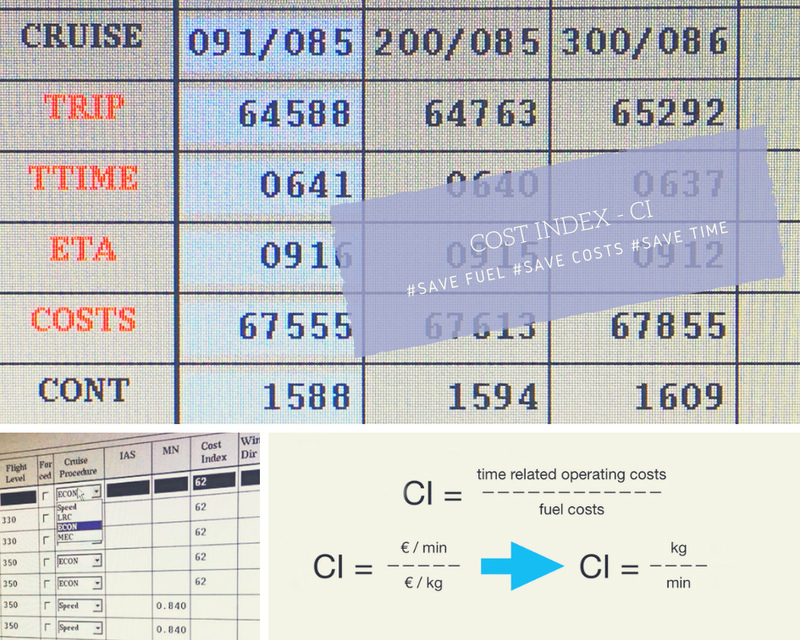 The CI’s denominator, fuel cost, fluctuates day by day, along with the oil price (also differs among #airports). Clearly, High fuel prices will trigger lower CI, i.e. lower speed – but so will low crew costs: If they decrease, the numerator of the CI does (math, baby 🤓). If a minute of #flightcrew duty becomes more „affordable“ (e.g in winter, with its lower scheduled flight hours), flying slower indeed saves money / fuel. contrary in summer: packed schedules, crew at max flighttime – causing expensive overtime. Consequence? A higher CI – to get more flights outta that precious duty time! Maintenance costs, on the other hand, are a rather ambiguous. fixed costs based on flight cycles (i.e. number of flights performed) don‘t influence CI. Then, there‘s procedures based on flight hours – and saving time matters. Yet, high thrust ratings also increase engine wear. Pour all that into some sophisticated #flightplanning tool, shake well – boom, get an individual CI for every leg! See top: flight‘s planned with CI 62; giving an initial TAS of 495 kts plus M.84 for the oceanic crossing. If increasing CI to 200, speed rises to +500kts TAS / M.85 – but why invest +600kg fuel if the flight is perfectly on time? The pages, of course, turn if the #plane leaves the gate 10 mins late (which is why we attach “summaries” for higher CI’s to any long haul flightplan: giving an overview of additional fuel consumption and possible time gain). So, bonus question: if you’re heading to a date (..hey, you got a schedule!) – at which speed would you fly, err, go? Run (arriving sweaty and panting) – or crawl (risking being late)?